Searching in Google, you will find iTunes Library missing is a problem that troubled many Apple users. Well, iTunes should never remove anything from your iTunes Library unless you specifically delete it. Such issues with the iTunes Library usually appear after the update or enabling iCloud Music Library in iTunes. If your iTunes Library disappeared, keep calm, here we’ll show you how to fix it and get missing iTunes Library back. You should know that iTunes keeps a copy of previous iTunes libraries every time you upgrade to a new version of iTunes. One way to fix the iTunes Library disappeared issue is to rebuild your iTunes library from a previous one. 1. Quite iTunes. 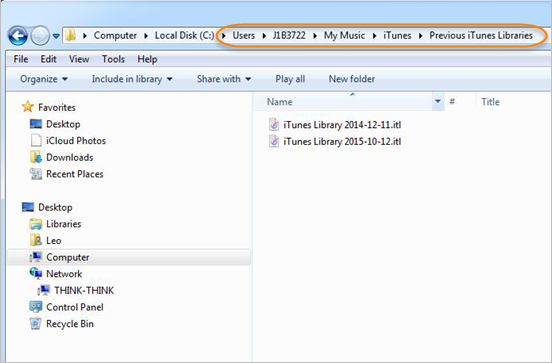 Go to the iTunes folder to find your iTunes Library file (iTunes Library.itl). Drag it to your desktop. 2. In the iTunes folder, open the “Previous iTunes Libraries” folder and find the latest iTunes Library file (iTunes Library YYYY-MM-DD.itl). 3. Rename the latest iTunes file and copy it to the iTunes folder. Now open iTunes, you will see your missing iTunes library is back. Note: Any changes that you made to your Library after the data you updated, such as new playlists that you created or songs that you added, might be missing. If you have synced your iTunes Library to your iPhone, iPad or iPod, you can use iTunes Transfer to bring the missing iTunes Library back on your PC. The software can auto-detects the difference between files on your device and iTunes, and copies what’s missing to iTunes, including music, playlists, videos, Podcasts, iTunes U, TV shows, music videos, audiobooks, etc. 1. Run the iTunes Transfer tool on your computer and connect your iPhone, iPad or iPod via USB cable. 2. iTunes Transfer will automatically detect the iOS device and display it in the main window. 3. 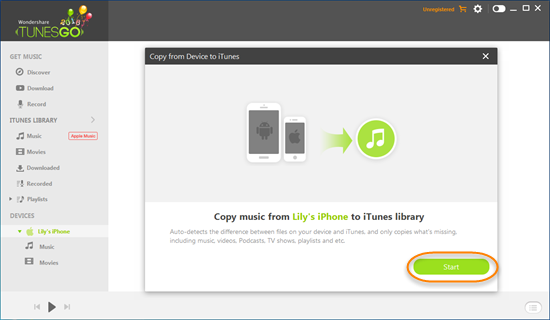 Click on “Copy Music from Device to iTunes” then “Start”. Then check the files need to be copied and click on “Copy to iTunes”. Note: The iTunes Transfer also helps to organize your iTunes Music Library perfect. With it, you can tag your music, change cover art, delete duplicates, and remove missing/broken tracks.